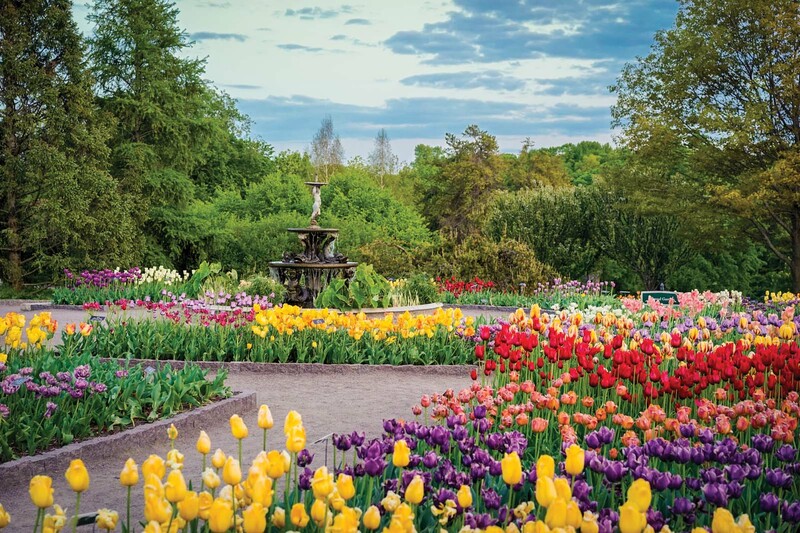 We chat with Duane Otto, creative mastermind behind the Minnesota Landscape Arboretum’s annual spring tulip display, about bringing the bright bulbs into your own garden. As one of the most well-known signs of spring, tulips are nothing short of stunning. Of course, this isn’t news to avid gardeners and especially not to Duane Otto, longtime landscape gardener and creative mastermind behind the Minnesota Landscape Arboretum’s annual spring tulip display. “It’s always challenging to make it more perfect and more wonderful every year,” says Otto, who boasts nearly three decades of tulip-planting experience. Despite the pressure, he’s confident this year’s display of spring blooms will be exactly that and more. Featuring nearly 100 varieties (including lily and parrot tulips), this year’s garden will include single and double, short- and long-stem, and mid- and late-season tulips in warm yellow, vivid orange, crimson red, and violet-blue shades—the ultimate tribute to a bright, sunny day. Want some ways for bringing these bright bulbs into your own garden? Here, Otto shares his top three tips for creating gorgeous displays. Choose color themes and group them together. He suggests your favorite colors, or something that complements your garden. When you limit your choices, the colors harmonize better. Larger groupings create more impact as well. Pick a perennial variety. They’ll last two to three years, he says. Plant in the cool season. Otto says to plant your tulips mid-October. And if you’re looking more for things floral, Art in Bloom at the Minneapolis Institute of Art is hosting its 36th annual Art in Bloom celebration—a jam-packed weekend of activities, workshops, lectures, and floral displays from April 11-14.